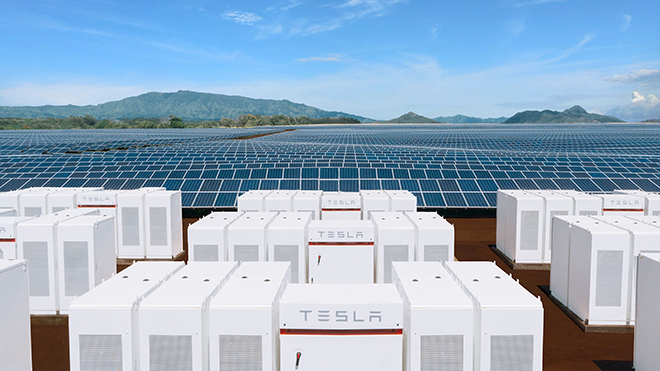 A Tesla energy storage system at a solar farm on the Hawaiian island of Kauai. By most measures, 2018 was a long-anticipated breakout year for batteries, with record volumes of investment flowing into research, product development and manufacturing as prices plummeted, governments established new policies supporting energy storage, and mass markets emerged for electric vehicles and electrochemical energy storage. That progress, though uneven across U.S. and international markets, sets the stage for a new era for energy storage in 2019 and beyond, industry analysts said. While growth faltered in some regions in 2018, global annual energy storage additions more than doubled, to 9 GWh, and are on pace to surge another 78% in 2019, according to Bloomberg New Energy Finance. In August, cumulative worldwide sales of electric vehicles passed the four million mark, the energy research group said, and it expects EV sales to surpass five million only six months later, in the first quarter of 2019, as transportation electrification quickens. U.S. energy storage deployments, on a rated-power basis, jumped 57% to an estimated 338 MW in 2018 following three years of flat to negative growth, Wood Mackenzie Power & Renewables estimates, while order backlogs point to annual additions of roughly 660 MW in 2019, 1,700 MW in 2020 and more than 3,850 MW by 2023. Venture capital investments into battery storage startups also hit new heights in 2018, with 38 transactions totaling $783 million through the first nine months of 2018, 40% more than a year earlier, according to Mercom Capital Group. Mergers and acquisitions among automakers and stationary battery companies also accelerated. Smart grid company SolarEdge Technologies Inc. kicked off M&A activity in 2019 with its proposed $77 million purchase of an Italian EV company, just months after acquiring a South Korean maker of lithium-ion batteries for $88 million. Since the end of 2017, suppliers of lithium-ion batteries have aggressively boosted their production plans for the next decade, eyeing automakers' multibillion-dollar deals, utilities' ever-larger contracts and major policy actions in key markets, especially in China, Europe, South Korea and the United States. New state initiatives in New York, California and Colorado have added to the momentum in the U.S.
With the addition of a host of recently announced factories and manufacturing expansions, including in the U.S., lithium-ion battery suppliers such as China's BYD Co. Ltd. and Contemporary Amperex Technology Co. Ltd.; Korean suppliers LG Chem Ltd., Samsung SDI Co. Ltd. and SK Innovation Co. Ltd.; and Japan's Panasonic Corp. and its U.S. partner Tesla Inc. are poised to reach at least 1,330 GWh of combined annual manufacturing capacity by 2028, Benchmark Mineral Intelligence forecasts, about 10 times greater than the industry's total capability entering 2018. Those expansion plans have sparked a rush on battery metals, including some tied to great risks, unleashing what one analyst described as "10 years of chaos to create a new blueprint [that] will underpin the way we use renewable energy and the push for electric vehicles." In particular, the extraction of cobalt, which is mined chiefly in the Democratic Republic of the Congo, presents suppliers and manufacturers with political, environmental and social risks. While electric vehicles, for now, represent the vast majority of battery demand, stationary energy storage is also coming on strong, with much bigger volumes on the horizon. "When you see projects now being planned at over 1 GWh in scale, when only 18 months ago a 300-MWh installation was something to behold, you know you have entered a new era," said Simon Moores, managing director of Benchmark Mineral Intelligence, in an email. "It has been quite interesting to watch the battery makers' dilemma of where to send the lithium-ion cells. Of course they have contracts to honor with automotive producers, but the order inquiries from [energy storage] producers have been incredible." In the United States, the development pipeline for utility-scale projects doubled in 2018 to about 33 GW, according to a recent report from Wood Mackenzie and the Energy Storage Association. Even that estimate may be low. 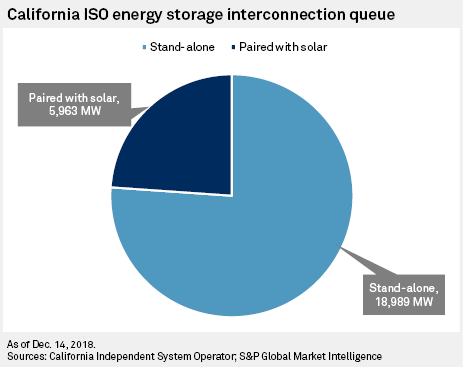 Roughly 25 GW was in the California Independent System Operator Corp.'s interconnection queue as of Dec. 14, including nearly 6,000 MW hybridized with solar, more than twice the amount listed midway through the year. More than 10,000 MW, or 10 GW, are in the interconnection queues of other grid operators around the country. Such volumes, while still speculative, are indicative of developers' high ambitions and are in line with the U.S. energy storage industry's target of adding 35 GW of new capacity by 2025. "I can beat a gas peaker anywhere in the country today with a solar-plus-storage power plant," Tom Buttgenbach, president and CEO of developer 8minutenergy Renewables LLC, said in an interview. "Who in their right mind today would build a new gas peaker? We are a factor of two cheaper." Some offers for energy prices from battery-backed solar arrays in the U.S. Southwest came in under $30/MWh in 2018, while the installed cost for large-scale battery storage only, modeled on a 20-MW system with four hours of storage capacity, dropped nearly 40% to $357/kWh in just one year, estimates Bloomberg NEF. By 2030, installed costs could fall another 52%, the firm projects. 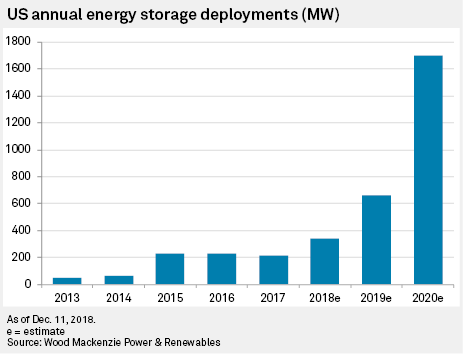 Given the rapid cost reduction, Wood Mackenzie believes the maturation of battery storage puts around 6,400 MW or more of new natural gas-fired peaking capacity in the U.S. at risk by 2027. Even as the battery sector booms, however, "2018 was very uneven in terms of progress," Logan Goldie-Scot, head of energy storage at Bloomberg NEF, said in an interview. With lucrative incentives, South Korea alone accounted for nearly half of the global market, he added, while others took steps backwards. The United Kingdom, for instance, "had a pretty grim year for near-term energy storage" due to the suspension of the U.K. capacity market, the analyst said. Stronger than expected global sales of EVs and energy storage systems led to a shortage of lithium-ion battery cells in 2018, especially for stationary applications, because Korean suppliers focused largely on their domestic market. Tesla, for example, reported shortages of its residential Powerwall systems in 2018, causing corresponding delays of rooftop solar-plus-storage installations. Such shortfalls were one reason some countries did not grow even faster in 2018, said Ravi Manghani, director of energy storage at Wood Mackenzie Power & Renewables. "At least in some pockets, [deployed energy storage] hasn't grown as quickly as we had anticipated," said Manghani, citing the firm's steady reduction of its 2018 estimate for the United States throughout the year. "There aren't any residential storage products available in the market right now," he said. "There are six-month to nine-month delays because LG Chem, to be specific, has had to cater to its domestic needs." Despite such challenges, the analysts agree that 2018 was a turning point for batteries in the global energy market that has set the stage for bigger things to come. "Even though progress was uneven, there was a much greater consensus in 2018 over the importance of energy storage, even in the near term, in major markets," Goldie-Scot said. "In 2017, there were still a lot of people talking about how energy storage was not necessarily a competitive solution and was going to be limited. I hear those conversations much less now ... Energy storage is now becoming more integrated into resource plans."